The Newest Rant: It's July 4th, Please Be Safe! Happy July 4th, everyone! This is the day we celebrate America, or what we would like America to one day be (e.g. a land that lives up to its ideals but right now is struggling to meet them). 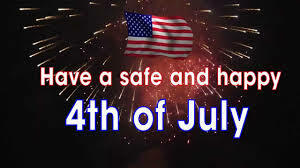 I just wanted to encourage everyone to be safe as this holiday of course is notorious for everything from drunk-driving to fireworks accidents (and of course accidents from using fireworks while drunk). So please, drink responsibly or have a designated driver/Uber driver ready to help if you're intoxicated. Also, use fireworks carefully and don't be that moron who lets their 4 year old shoot bottle rockets at people and then is surprised when somebody ends up at the ER. Basically, use your logic and have fun whilst being reasonable. Oh, and if you live outside of the United States and any of its territories or protectorates this is just a regular day for you, so feel free to carry on as normal.